Merci! That's the least the French could say. Ouch! That's the pain that would come from parting with A$50 billion, after the initial euphoria is over. And Oh ****! would be the response with the realization of the enormity of the task ahead. Australia's quest to replace its current fleet of six Collins-class conventional diesel electric attack submarine is officially known as the SEA1000 Future Submarine Program. It aims to provide the Royal Australia Navy with " an affordable, regionally dominant, conventional submarine capability, sustainable into the foreseeable future ", so that it can safeguard its sea lines of communication and its economy which is worth A$1.6 trillion annually. The Aussies wanted them BIG and they wanted them quick. Twelve boats are needed in total. They have to be constructed locally in Australia and they had to have American combat and weapon systems. As there were no off-the-shelf options that can fulfill Australia's unique operational requirements, they began looking for an international partner to design and build their next generation boats, the details of which can be found here. 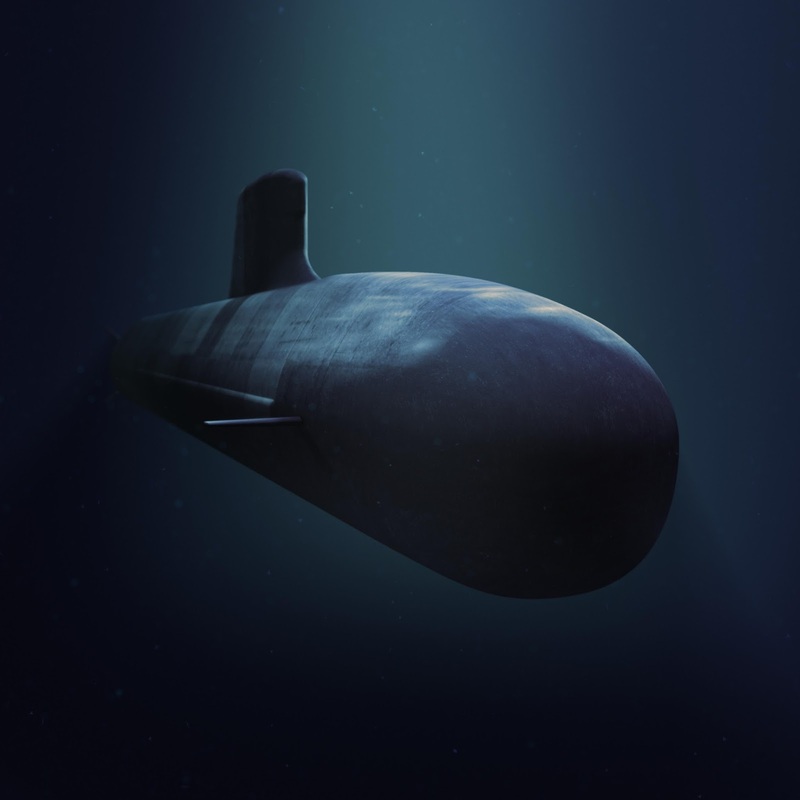 After a long drawn competitive evaluation process, Prime Minister Malcolm Turnbull announced last week that the French Shortfin Barracuda designed by DCNS had been selected, thus ending months of speculation by defense analysts as well as the general public alike. The Shortfin Barracuda is actually a conventionally powered variant of the Barracuda-class nuclear attack submarine ( SSN ), specially customized for Australia. It is brilliantly named after the Australian Barracuda or Shortfin Barracuda whose scientific name is Sphyraena novaehollandiae. French national ship builder DCNS needs no further introduction. Malaysia's Gowind-class frigates and Scorpene-class SSK, Singapore's Formidable-class stealth frigates, and the Mistral-class BPC so coveted by Mr Putin, were all constructed by this innovative company. The Barracuda-class submarine currently under construction for the French Navy is France's second generation nuclear attack submarine meant to replace their six Rubis-Amethyste-class SSNs. It displaces 5300 tons submerged and 4765 tons surfaced and measures about 100m in length. Its nuclear reactor provides an unlimited range, requiring refueling and complex overhaul ( RCOH ) only once in ten years. Its endurance is about 70 days, the limiting factor being the amount of food it can carry for its crew. It is extremely stealthy and quiet, featuring pump jet propulsion instead of propellers. It can be armed with a variety of weapons including torpedoes, mines, SM39 block 2 Exocet anti-ship missiles and SCALP Naval land attack cruise missiles. First-in-class FS Suffren is scheduled for launch in 2017 and the six boats cost the French government €9.9billion. 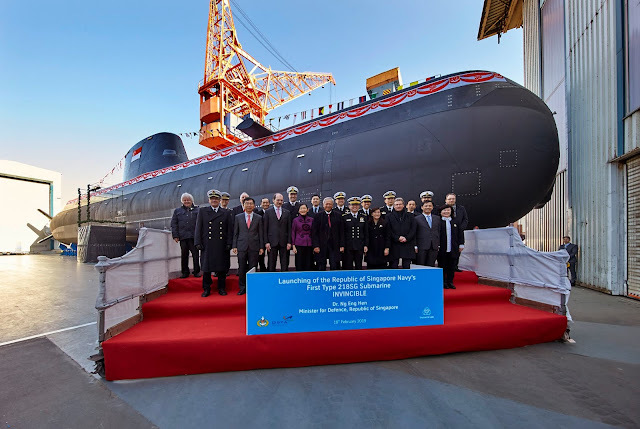 The Shortfin Barracuda debuted as the SMX-Ocean SSK at Euronaval 2014 and quickly evolved into its current form as the world's most advanced conventional submarine customized for Australia's needs. 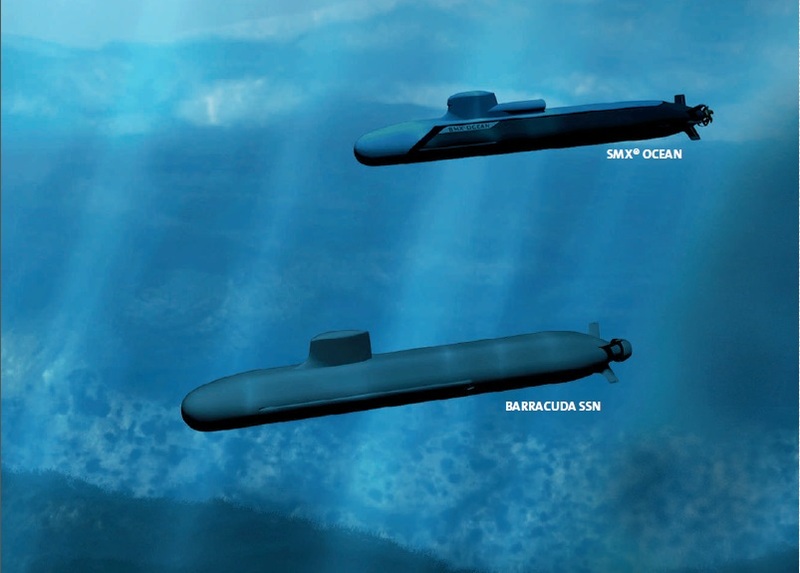 It will be slightly shorter than the Barracuda SSN at 97m and also smaller, displacing some 4500 tons when surfaced and " more than 4000 tons ", probably closer to 5000 tons, submerged. Powered by diesel engines and advanced fuel cell air-independent propulsion system, it can remain underwater for up to 3 weeks and has a range of 18000nm ( 33300km ) at 10 knots and an endurance of 80 days at sea. Maximum diving depth is 350m or deeper and its maximum speed will be 20knots. It will have a complement of 60 officers and ratings, plus it can carry another 20 special forces personnel. It will have " the most powerful sonar ever produced for a conventional submarine " and the same pump-jet propulsion system and the same enhanced stealth features inherited from its nuclear cousin. Pump-jet technology is said to make propellers obsolete, as they can be a thousand times quieter and achieve much higher speeds before cavitation ( bubbling phenomenon ) occurs. It also allows for high maneuverability with the addition of a steerable nozzle, creating vectored thrust. However, it can be less efficient than propellers at low speeds. Other notable features include an X-rudder like the Japanese Soryu boats where the four blades can twist and turn in different permutations and provides superior maneuverability especially in shallow waters, retractable hydroplanes which reduces drag and noise, non-hull penetrating optronic masts and special hull hatches for easy upgrading in the future. Its combat system and weapon systems will be American, as the Aussies value interoperability with their closest ally the United States. So we can expect an improved version of the AN/BYG-1 combat system, Mk48 Mod 7 Common Broadband Advanced Sonar System ( CBASS ) heavy torpedoes jointly developed by the US and Australia, UGM-84 submarine launched harpoon missiles, UGM-109E Tomahawk land attack cruise missiles, Mk60 CAPTOR mines, Mk67 submarine launched mobile mines and such. Swimmer delivery hatches, unmanned underwater vehicles ( UUV ) will probably be part of the package as well. At A$50 billion, it is Australia's single biggest defence procurement to date, though this spending will be spread out over the next thirty years or so. At least two thirds of this money will be allocated for future upgrades, sustainment, operations and in-service support of the submarines which means the initial builds would cost A$20 billion or less. Here's a video of the Shortfin Barracuda from DCNS. The Swedes were eliminated early in the race, due largely to the fact that they had not built a single submarine independently for the past two decades, and perhaps also because they were the designers of Collins-class submarines which were giving the RAN so much trouble. Of the three that made it to the competitive evaluation process phase, the Germans were dropped for concerns that they had not built anything more than 2000 tons so far, even though they were the most prolific boat builders, supplying more than 160 modern SSKs to navies worldwide. The Japanese Soryu-class submarine was not chosen purportedly because it lacked the range that the Aussies desired. The berthing compartment is also too small for the Australian sailor who typically have a taller stature compared with their Japanese counterparts, this even after a 6 to 8m hull lengthening modification. The French design, on the other hand is not only super stealthy but also technologically the most advanced, and most importantly has the range equal to or exceeding those of the existing Collins-class boats. DCNS had also the expertise in building submarines up to 14000 tons in the form of nuclear ballistic missile submarines ( SSBN ) or boomers, like the four Triomphant-class boats currently in service with the French Navy. You can see for yourself why the Shortfin Barracuda could have been so appealing to the Aussies through the above video made by DCNS on the operational capabilities of the SMX-Ocean some months ago. 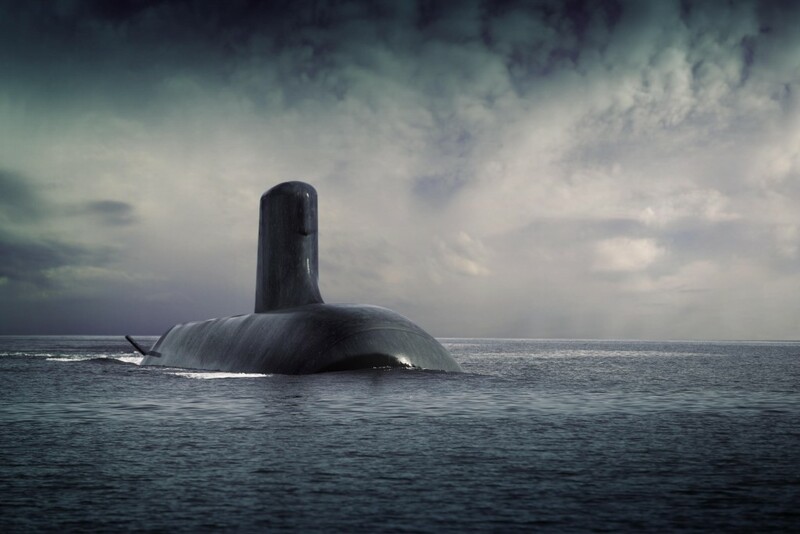 All the construction of the Shortfin Barracuda submarines will be done in Australian naval shipbuilder ASC's Adelaide shipyard with the help of DCNS. The project can generate 2900 jobs locally and will no doubt be a great boost to the South Australian economy for many years to come. Because submarines are among the most complicated machines that humans have ever designed, the task ahead for ASC is huge and they know it, describing the construction of the Collins-class SSK as an unprecedented feat of engineering, design and logistics in Australia. Work had to be co-ordinated with 150 major contractors and hundreds of smaller suppliers and many modules were constructed off-site and then shipped to Australia for integration at ASC. Some 33000 drawings and 5000 work orders had to be issued before work could even begin and each submarine required 250000 man-hours over 60 months to assemble. The Shortfin Barracuda is light-years ahead of the Collins in terms of complexity and the question now is whether ASC is up to the job. DCNS Australia describes the task as mammoth and at least twice as big as the Collins project. 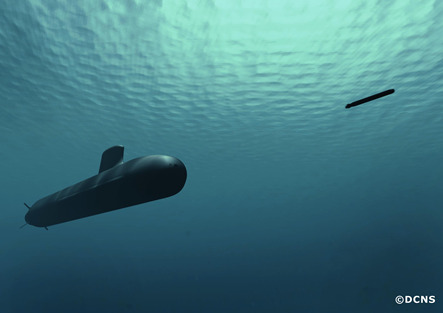 For A$50 billion, France has promised the Australians full transfer of stealth technology utilized in their SSN and SSBN submarines, the crown jewels of their submarine designs that they have never shared with anybody else before. 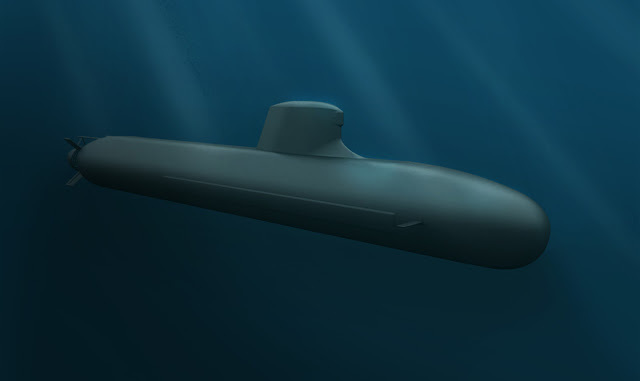 Even though the submarines are to be constructed in Australia, another 4000 jobs will be created in France itself in support of the Shortfin Barracuda project. Looking ahead, contract signing will probably take place in 2017, construction will start between 2022 to 2024 and the first submarine will probably launched in 2028 and be commissioned by 2030. 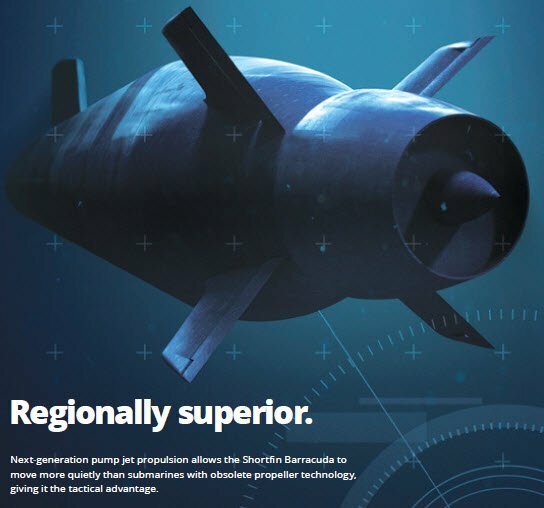 The Shortfin Barracuda is expected to remain cutting edge in terms of operational capabilities until 2060 and will probably in active service until 2070. If the Collins boats were to be retired starting from 2025 as planned, there will be a capability gap which the RAN has to address. The most likely solution will be to have some sort of life extension program to postpone the decommissioning of the Collins-class, but then again, I'm not sure if that's tantamount to flogging a dead horse. Apart from France, South Australian politicians and the naval shipbuilding industry of Australia are big winners as they successfully canvassed for the submarines to be completely constructed in Australia, never mind the competency of the local work force or the available infrastructure. The construction and more importantly the sustainment of the submarine fleet meant that a constant flow of jobs and money into South Australia will be almost a guarantee for the next fifty years. The Royal Australian Navy could be big winners with the chance of a lifetime to once and for all rectify all the misgivings of the Collins and acquire an underwater capability way beyond their current level and maintain it that way for decades to come, but only if the submarine construction goes smoothly. Chances of that happening is almost close to zero, if historical events could be used as a gauge. Not only had ASC bungled the Collins construction and their subsequent upgrading and sustainment, they have, as part of a consortium, continued to mess up the until now the most expensive defence procurement - the A$8 billion SEA4000 Air Warfare Destroyer project. The Hobart-class AWD are 3 years late with an estimated A$1.2 billion in cost overruns. Its going to be difficult even just to be cautiously optimistic. Japan was the early favorite in the race for SEA1000, with Shinzo Abe and Tony Abbott being good pals and the inking of a contact for joint development of submarine technology in 2014. Even the Americans also favoured the Japanese since they too have a direct stake in this mega-project as the provider and integrator of the combat and weapons system and would have to work with whoever the Australian chose. An American-Australian-Japanese alliance would also be a good thing to check Chinese ambition in the South China Sea. However, lack of experience with international arms deals and the subsequent ousting of Tony Abbott as prime minister probably doomed the Japanese effort. Japan did not agree to support full construction of the submarines in Australia until very late in the game, after France and Germany had indicated their willingness to do so. Their team of negotiators sent to Australia was said to be comprising of a mix of business executives and Ministry of Defence bureaucrats who had never worked with each other before. Of course the oriental way of business conduct, where a handshake alone would seal a deal, where trust and honour is valued above all else, might be perceived very differently in western cultures. It is not surprising that Japan was rather peeved to learn that the deal had gone to their competitor when they had invested so much time and effort and that just slightly more than a year ago, they were the front runners. Turnbull will have a great time trying to pacify them and manage the fallout. While the two countries pledged to continue their co-operation in defence research the relationship will never be the same. Hopefully Japan will learn from this experience and turn failure into success in future deals. Best Submarine at the Best Price? That was what Tony Abbott promised the Australians but that's not what they are going to get. The entire project had been hijacked by the politicians who have their own agendas to field and don't give a damn what happens a decade or two in the future when they will probably no longer hold office. Building the submarines in Australia is widely reported to carry with it a 30% to 40% premium as opposed to constructing them in their country of origin. The risk of delays and cost overruns is extremely likely given the size and complexity of the project as well as the quality of the local work force. Even if the French design had been chosen on merits of technological advancement, the Aussies could have at least let the French handle the construction in France. What's the use of the best submarine in the world if it can't be put to sea half the time and the other half of the time is spent combating defects? A procuring a submarine fleet is a long term investment, a strategic partnership that will bind the two countries, in this case France and Australia, for the next 50 years. Good or bad the Aussies would have been stuck with the deal for the next half a century. These submarines are not disposable if anything goes wrong since they are highly customized for Australia's needs and probably nobody else can afford them anyway. The Australian Navy will really have to keep its fingers crossed. As the quest for better submarines continues, we can only wish the RAN Bon Voyage!